A worker at Boka Tobacco auction floors displays some of the tobacco crop, in Harare, Zimbabwe, Tuesday May 14, 2013. The country's tobacco selling season kicked off in February and to date tobacco worth over $400 million dollars has been sold to buyers mostly from China and the European Union. Noisy trolleys roll bales of tobacco on and off the auction floors in Harare, Zimbabwe's capital. Here they call it "green gold." Some of the country's estimated 100,000 small-scale tobacco farmers look on, hoping for profitable sales. Auctioneers, quoting prices at high speed, pace up and down rows of extra-large jute-covered bundles, with yellow tobacco leaves spilling out. Closely behind the auctioneers follow the tobacco buyers. They indicate interest with a wink, a nod, two fingers up, eyes closed and all manner of gestures. Celani Sithole is an auctioneer and floor manager at TSF — Tobacco Sales Floor — in Harare. "Our standard sale speed is supposed to be five seconds per bale," she says. Sithole says they're pushing through 7,000 to 8,000 bales a day. Farmers get their money the day their tobacco is sold. "As soon as the bales are sold, before arbitration, the farmer has the right to cancel the bale or accept the price," says Sithole. What we're witnessing on the auction floor is a far cry from just a few years ago. Output of most crops, including tobacco, dropped dramatically when President Robert Mugabe's followers violently drove white farmers, the backbone of the economy, from their industrial-sized farms, starting in 2000. The government handed the annexed land to black farmers, many of whom had little or no experience. The result was disastrous and the economy collapsed in a spiral of hyperinflation. Once the breadbasket of southern Africa, Zimbabwe began importing food. Tobacco production also suffered. Export earnings fell from $600 million in 2000 to $175 million in 2009. But tobacco output jumped 235 percent last year, compared with 2009. The CEO of the Tobacco Industry and Marketing Board, Andrew Matibiri, says production has rebounded. "It's back to normal almost," he says. "In terms of world production, we're nowhere near the top — but we're probably at number two or number three, after Brazil and the United States." Matibiri says farming was especially hard-hit, in part because unlike the industrial white farmers who were landowners, Zimbabwe's new black farmers are leaseholders and couldn't get credit or bank loans without title deeds. So the tobacco sector and private companies stepped in with a new scheme. They contract with tobacco growers to produce the crop, providing fertilizers and chemicals. Taizivei Chitaunhike is one of those farmers. The mother of four received her five-hectare farm from the government in 2003. She smiles shyly as she describes how her fortunes changed when she became a contract farmer two years ago. "If you grow with contractors, you will manage to do all the things that you like on your farm," she says. "The amount of capital that they give me helps me. For sure, I'm now much better for farming production. Tobacco is much better, because I manage to do all my budgets on my farm, we manage to pay school fees, labor, get food and other things." Chitaunhike says she has been up to the auction floors three times this selling season, with almost 25 bales of tobacco, and is getting good prices. Sitting close by, under a young jacaranda tree, and listening attentively to Chitaunhike, is another tobacco farmer, Milca Matimbe. She's 53 and got her 27-hectare farm ten years ago. Matimbe has been growing tobacco for five years but does not have a contract with a company. She sells independently and is disappointed with sales this season. "The prices are not so good for us," she says. "Last year it was better than this year, because the prices are not going up, they're going down. Ah but we have got good tobacco. We don't know if we can go back to the fields this coming season, because we've got no money." Zimbabwe consumes only a fraction of its tobacco output. Tobacco marketing board CEO Matibiri says the flue-cured tobacco is top quality, much prized and expensive. Forty percent of exports go to China, followed by the European Union and South Africa. "We produce a premium product, which is in demand the world over," he says. "It is said to have very good blending properties. In other words, it mixes very well with lower quality tobaccos produced in other parts of the world, producing nice, very pleasant cigarettes to smoke, if you're a smoker – yeah." Back on the auction floor, brisk tobacco selling continues. It appears the banks are listening. The Bankers Association of Zimbabwe looks set to lend a billion dollars to agriculture this year — the lion's share going to tobacco farming. It is peak tobacco-selling season in Zimbabwe. Tobacco production took a nosedive in the mid-2000s, when President Robert Mugabe's land reform policy led to the seizure of white-owned farms. A decade later, farming is having a revival in Zimbabwe. From the capital, NPR's Ofeibea Quist-Arcton reports. OFEIBEA QUIST-ARCTON, BYLINE: Noisy wooden trolleys roll bails of tobacco on and off the auction floors in Harare. Here, they call it green gold. Some of Zimbabwe's estimated 100,000 small-scale black tobacco farmers look on, hoping for profitable sales. QUIST-ARCTON: Auctioneers quoting prices at high speed pace up and down rows and rows of extra-large, jute-covered bundles with yellow tobacco leaves spilling out. Tobacco production jumped to 235 percent last year, compared with 2009. QUIST-ARCTON: Closely behind the auctioneers follow the tobacco buyers. They indicate interest with a wink, a nod, two figures up, eyes closed and all manner of gestures. Celani Sithole is an auctioneer and sales manager at TSF - Tobacco Sales Floor. CELANI SITHOLE: Our standards sale speed is supposed to be five seconds per bale. We go up and down the lines. We are quite organized. QUIST-ARCTON: Sithole says they're pushing through seven to 8,000 bales a day of the cash crop, and tobacco farmers are paid promptly. SITHOLE: As soon as the bales are sold, before arbitration, the farmer has got the right to either cancel the bill or except the price. It's quite a speedy process. QUIST-ARCTON: What we are witnessing on the auction floor is a far cry from just a few years ago. Output of most crops, including tobacco, dropped dramatically when President Robert Mugabe's followers violently drove white farmers, the backbone of Zimbabwe's economy, from their industrial-sized farms, starting in 2000. The government handed the annexed land to black farmers, many of whom had little or no experience. The result of Mugabe's controversial land reforms was disastrous. Tobacco export earnings fell from $600 million in 2002 to $175 million in 2009. In his echoey (ph) office, CEO of the Tobacco Industry and Marketing Board Andrew Evaristo Matibiri says production has rebounded. ANDREW EVARISTO MATIBIRI: It's back to normal almost, to the extent that it's still a bumper harvest. And in terms of world production, we're nowhere near the top, but in terms of supplying the world markets, we are probably at number two or number three after Brazil and the United States. QUIST-ARCTON: Matibiri says farming was especially hard-hit in parts because unlike the industrial white farmers who owned the land, Zimbabwe's new black farmers are leaseholders and couldn't get credit or bank loans without title deeds. So the tobacco sector and private companies stepped in with a new scheme to fill that funding gap - contracting growers to produce the crop and providing them with fertilizers and chemical. Taizivei Chitaunhike is one of those farmers. The mother of four received her five-hectare farm from the government in 2003. She smiles shyly as she describes how her fortunes changed when she switched to contract forming two years ago. TAIZIVEI CHITAUNHIKE: Tobacco is much better because we managed to pay school fees, food and other things, yeah, on all out budgets. It's much better. The amount of capital that they give me - it helps me. For sure, I am now much better for farming production, so this is nice for me to be contracted. QUIST-ARCTON: Chitaunhike says she's getting good prices and has been up to the auction floors three times this selling season, with almost 25 bales of tobacco. Sitting close by under a young tree and listening attentively to Chitaunhike is another tobacco farmer, Milca Matimbe. She is 53, got her 27-hectare farm in 2005 and has been growing tobacco for five years. Matimbe does not have a company contract and sells independently. She's disappointed with sales of her yield. MILCA MATIMBE: This is so serious. Last year, it was better than this year because the prices are not going up, but are going down. I don't know if we can go back to fields this coming season because we've got no money. 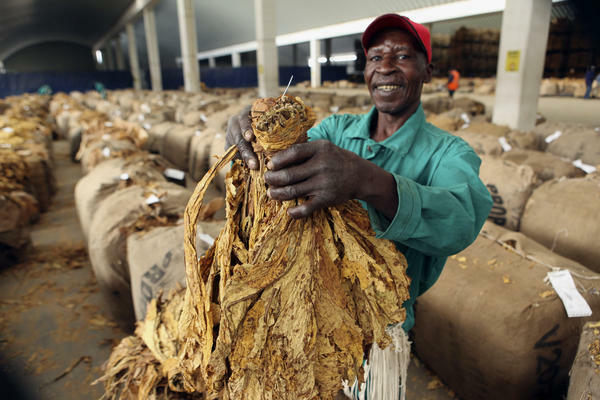 QUIST-ARCTON: Zimbabwe consumes only a fraction of its tobacco output. The marketing board CEO Matibiri says that flue-cured tobacco is top-quality, expensive and in demand. Forty percent of exports go to China, followed by the European Union and South Africa. MATIBIRI: It is said we have very good blending properties. In other words, it mixes very well with low quality tobaccos produced in other parts of the world, producing nice or very pleasant cigarettes, if you're a smoker. QUIST-ARCTON: Back of the auction floor, brisk tobacco trading continues. It appears the banks are listening. The Bankers Association of Zimbabwe looks set to lend a billion dollars to agriculture this year - the lion's share going to tobacco farming. Ofeibea Quist-Arcton, NPR News, Harare. Transcript provided by NPR, Copyright NPR.